Implied Signals that you passed the exam. Now that I have a lot of time at my disposal, I was pondering over this forum when I came across a post from last year. The post states some kind of modification in ‘Scholarship’ section on CFA website, which could indicate pass or fail status of a candidate before the results are officially declared. However I am not aware about the accuracy of the same. Also the website seems to have modified since the post. Hence this cannot be confirmed. I was wondering if you’re aware of any such implied signs on website indicative of the candidate passing before the results are officially announced. On GARP’s website (FRM exam) there are quite a few signs which indicate that a student has passed, before the results are officially declared. This indicates that a candidate has passed. The above message worked for me, as I received the same alert when I logged into the website and I actually passed. Hence please do share if you know such early ‘tells’ which could imply the pass or fail status of a candidate. I think it’s still too early for this thing. Based on the link from last year, i assume that CFAI had already communicated when the exam results would be released (last year) - causing differences on what could be seen by different users. Right now, i think all of us have the same view on our account. Yeah that seems reasonable enough. It’s just that I can’t hold on my stomach for so long. The wait is too much. Anyone else with me ? I’m with you. Felt really good right after the exam, but, as was the case with L1, feelings of doubt about the minority of questions I was unsure of start to weigh on me. It is going to be a long 6 weeks! My heart starts to beat faster whenever i think/remember about the exam. My doubts really come from the PM portion. I participated in that thread from last year. I believe it was inconclusive and results varied on the internet browser you tried it on. Some of the signs of a ‘pass’ i had seen myself, but was band 10 last year. I would not put any correlation to GARP’s own process and CFAI as well. Generally, people feel good after the exam and as the weeks progress start to doubt their performance. It is not unusual but just keep going back to how you felt right after the exam. Last year, I said i’m not sure, i feel like a band 10 or barely pass and sure enough i was band 10. I am trying not to think much about the exam. I know that sooner or later I will pass all 3 levels ;-). I actually had this telling sign happen to my account last year… Still got band 10. I think the best signal you passed the exam is when they tell you you did on results day. But I’m no expert. I participated in that 1 or 2 box scholarship survey as well and i was a true believer because it worked in my case so has to be 100% correct. In essence the theory was prior to the results coming out, if you could select to apply for the scholarship then it means you failed but if you couldn’t apply then it was a pass. Because the system was updated with all the results to determine who could apply or not. I could apply for the scholarship and had this sinking feel i would get a fail, and guess what? Failed! The best indicator on CFAI website is the percentile and average score on the CFAI test bank. Anyone crossed 60 percentile and 70% average score on the test bank in my opinion should be fine. just curious, how have you determined these criteria for passing and what makes you confident that they are the right thresholds? Rational : the average pass rate is approximately 46% . So basically your percentile rank should be 54th percentile and above to be in the top 46%. Assuming that the majority of candidates used the test bank then it’s good indicator on how you are ranked among other candidates. Yes, well aware of what a percentile is and what it means. Was trying to understand how you determined those results from practice problems were an indicator of anything other than being well prepared. Just based on your response it sounds more like a guess vs. actual experience. Either way, none of that matters now - we’ll find out how we did in a few weeks. i wouldn’t waste any time thinking of practice problems and percentile rank translating to the actual exam. Why? because people can do the topic tests (and even practice exams) and then redo them just remembering the answer. Which is what i found, as the exam day came closer, my percentile rank dropped. I believe your overall accuracy would be a better indicator. For example, taking the practice exam and scoring 78% is a better metric than your percentile rank being 80. I think imy overall percentile rank dropped ridiculously…but i never did that many topic tests and I smashed the exam. 1- Lets say you achieved 60th percentile. What does that tell you? Even though other candidates memorized the answers or did the practice problem with an open book your still better than them. 2- The candidates who did the practice problem without studying resulting in a lower score will have an offsetting impact on the candidates who did the exam with a open book or memorized the answers. In conclusion, all the candidates have the exact opportunity and percentile rank tells you how you are ranked among them. I agree with rsparks - the percentile rank seems worthless as it depends when the overall group took them and then how many times each individual candidate retook those questions. I think they were more helpful in nailing down the topics themselves but I wouldn’t say that just because you were in the 70th percentile in the test bank compared to everyone else that you were ‘set’ for the exam. Too many variables that influence the percentile ranks on the website. If you did BOTH practice exams on CFAI website and did not cheat, or look up answers, sat for it starting in the morning with the normal break, scored well? You probably passed the exam. Your argument against that is, those two tests are a small sample of questions when compared to the amount that could be asked. However, I think they do a good job of covering all areas conceptually that are important. Additionally, other candidates probably did take practice exams open book/looked up answers, so your rank percentile wise if you know you did not do so, is probably even higher. I had a check yesterday and they split your accuracy between topic tests and mocks but only include your overall percentile rank. I believe they should split the percentile rank. That would improve the metric when comparing percentile rank to mocks but there are a lot of issues as discussed. Same here, for June 2019 test. I can apply as well. I hope it’s just a bug. Yeah same here. I wonder if everyone is able to apply for it? What’s the path for this? Thanks. I have it too. I wonder if since we’re all L2 candidates this is turned on for everyone regardless. 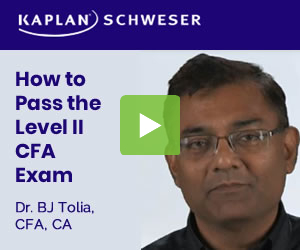 Pass or fail - there’s still one more to go. Yeah I wouldn’t get too excited about it, come 08/14 and we’ll know fo sho!